In Vietnam, American Special Forces soldiers soon learned a lesson their ancestors knew very well--a tomahawk is better than a knife for close combat. In spite of its popularity, my own opinion of the Vietnam tomahawk has always been that it's a wimpy little ax, with a head that's too small for real work and a handle that will snap like a twig. It's a crude blunt instrument that looks like an ax. The SOG Fusion Tactical Tomahawk takes the concept behind the Vietnam Special Forces ax and gets rid of the many problems. Weight is a major concern whether you are a hunter or a soldier, and you need a lot of positives to carry a 24 oz axe as a regular part of your kit. The SOG Fusion justifies every ounce. 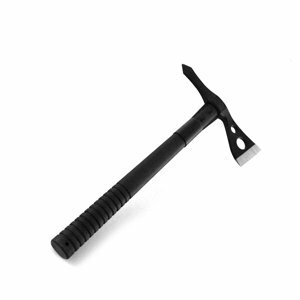 The steel ax head, with the traditional military spike for balance, has a 2 3/4" straight edge that's properly ground so you can efficiently chop wood or heavy bone. Hunters of big game often find a small ax to be more efficient at butchering tasks than a heavy knife, something nearly everyone knew in the frontier days. The weakest point of the old Vietnam axe was the wooden handle, too thin at the juncture with the axe head to be reliable. The Fusion has a much less destructible fiberglass handle with rubberized grip. Once marketed as "unbreakable," fiberglass proved to be much less than perfect as a tool handle. The tang and rivet attachment of head to handle that you see in the Fusion is an excellent solution to the old issue of head separation, a puzzle that smiths have battled for centuries. Used with some skill, this combination really should last forever. In camp you'll find it's endlessly practical.